The 504 Gallery is excited to present Contemporary Visions, a group exhibition exploring the artwork of both local and international artists. The collection showcases different viewpoints and perceptions – as revealed by the distinct approaches to Contemporary Art of each piece. Inspired by both past and contemporary influences, they speak many languages and styles, communicating and expressing their concept-illuminating perspectives. From the representational to the surreal, and the realist to the abstract, each art form featured represents a particular vision – to be interpreted in different ways. 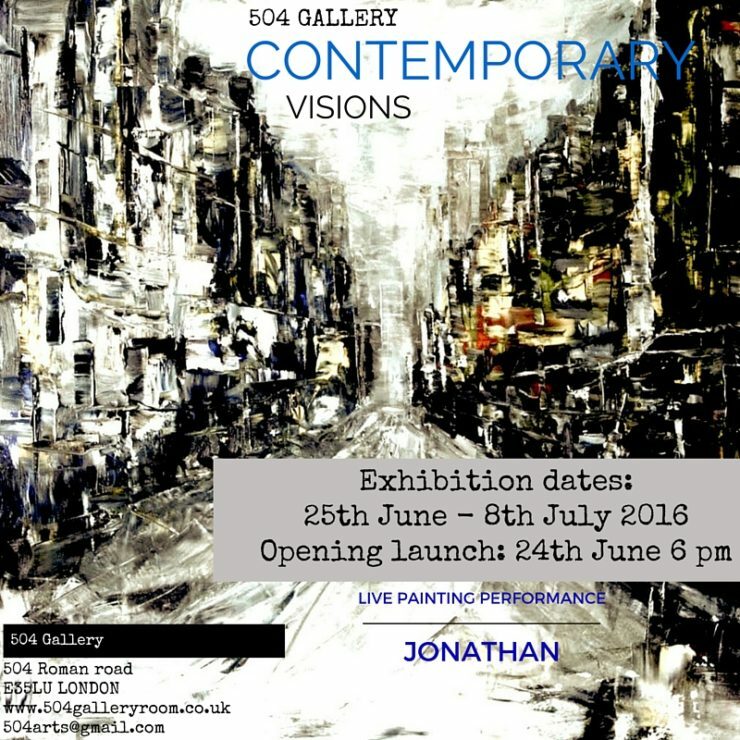 Live painting will also take place at the Private View, on Friday, 24th June. This is a form of visual performance art, in which artists complete an art piece as a public performance – wherever that might be. The performance involves four basic elements: time, space, the performer’s body or presence in the medium, and the relationship between performer and audience. The actions, at a given place and time, constitute the work. The painting process shares dreams and visions: thought-refracted and brush-danced. Longing, echoed voyages, my paintings breathe dreams from the Devine Feminine’s sado-romantic lullaby; they carry me, the canvas-woven pixels guiding my mind with their matrix of angled shadows. Natural harmonics lift me up — hence the massaging, extrapolating induction of my tantric accompaniment: europop’s warm, sidereal rhythm and siren vocals, whose dulcet wilderness presses beats deep; tickling the spine, as sedate, pre-1950s popular music could but rarely. Sado-Romance sees harmony dance with thought — and tickle space, to tell its story. ARTISTS: Amanda Denise Graham, Ana Beatriz Diaz Perez, Belinda J. Nailon, Diana Peisley, Giorgio Rinaldi, Jonathan Graham, Niccolo’ Muccio, Paolo Penitente, Tim Lord .